Because it has become increasingly difficult to cross borders and in order to stay under the radar of law enforcement authorities, migrant smugglers are developing more and more ways to facilitate moving irregular migrants into or within destination countries in the EU. Some of the most recent trends in migrant smuggling have now been published in the latest European Monitoring Team Special Edition Report from Europol’s European Migrant Smuggling Centre. Dangerous concealment methods in airtight containers and vans, or in vehicle engine compartments. These latest trends deserve special attention because of their potentially life-endangering impact on migrants. Law enforcement has noted an increasing number of incidents indicating attempts to conceal migrants in various ways in vehicles through the border crossing points. The most often encountered method still remains the use of lorries and vans to smuggle migrants. Overcrowding, a lack of air and travelling at high speed to circumvent law enforcement action, are only a few of the dangers associated with smuggling via road. One of the most recently detected transportation methods is to conceal irregular migrants in engine compartments while crossing the borders. 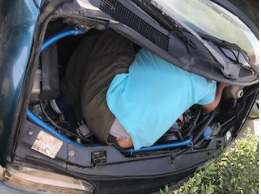 Before approaching the border crossing points the migrants are placed in the engine compartment of the vehicle used for their transportation. 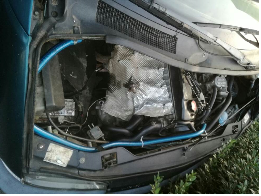 The migrants are hidden on top of the vehicle’s engine taking advantage of the space available between the engine and the bonnet. The method is extremely dangerous and the lives of migrants crossing the border in this manner may be at risk. The irregular migrants travel together with the smuggler for the majority of the journey and are only concealed in this way during the border crossings. One example shows that for this service, migrants had to pay around EUR 7000 for a one-way trip from Turkey to Austria. These developments demonstrate that migrant smuggling remains a highly attractive business among criminals. Europol’s European Migrant Smuggling Centre (EMSC) follows these rapidly developing trends to enhance the level of specialist support and to allow law enforcement across the EU to fight this illegal activity more effectively. Effective action requires international cooperation between the law enforcement partners. For this reason, the EMSC periodically publishes a report called European Monitoring Team Report (EPMT). It started exactly two years ago and has just now produced its 300th edition. The EPMT is a valuable reference document to support law enforcement and authorities in their decision making processes. This special edition covers a number of statistics and developments in the field of organised smuggling. It also touches upon the main routes and modi operandi currently employed by migrant smugglers, the contribution of EU Member States and partners to the EPMT exercise, the activities and capabilities of Europol, as well as the way forward. More information on the latest trends can be found in the EPMT infographic.